Thank you for booking with Tribecar. This page stipulates the terms and conditions (this "Agreement") between Tribecar and you as a member of our Website and/or user of our Services ("Hirer" and/or "you"). Please read this Agreement carefully before using the Services and Website as, by accessing and registering as a member on our Website, and/or using the Services provided by Tribecar, you acknowledge that you have read, understood, and unconditionally agree to be bound, without any limitation or qualification, by the terms and conditions contained in this Agreement. We may need to make changes to this Agreement from time to time. We may unilaterally change the terms of this Agreement and we shall send you a notification of the same. You acknowledge that it is your responsibility to check the notification and/or the updated Agreement upon such notifications or during creation of new bookings or commencement of your Rental Period. You further agree that your continued use of the Website and Services following the changes to this Agreement indicates your acceptance of any such changes to this Agreement. In case of dispute, Tribecar reserves the right of final decision on the interpretation of the terms and conditions in this Agreement. a Singaporean holding a valid Singapore Driving Licence for it's classification of vehicles (class 2B/2A/2/3A/3) with a valid debit or credit card. The Hirer will be required to have at least 2 years of driving experience. In the event that the Hirer has less than 2 years of driving experience, the Hirer shall be subject to additional membership approval requirements and/or additional terms and conditions relating to the use of the Services. Under the applicable traffic laws in Singapore, if the Hirer is non-Singaporean, he may only use his International Driving Licence for up to 1 year (from the time of his arrival) in Singapore, after which he must obtain a Singapore Driving Licence. For insurance purposes, if a Hirer has both an International Driving Licence and a Singapore Driving Licence, we will only count the years of driving experience from the date of issue of the Singapore Driving Licence. If the Hirer is younger than 23 years old AND/OR has less than 2 years driving experience (as indicated on their Singapore driving licence), he shall also be classified as a "New Driver(s)" and be subject to the additional membership approval requirements and/or such additional terms and conditions as may be set out by Tribecar in this Agreement. The Hirer is to provide a coloured scanned copy his/her original identity card, driving license and proof of residence upon registration. For New Drivers, they may be requested to complete a video conference with the employees of Tribecar to verify the details of such New Drivers. A screenshot will be saved to keep a record of such video conference. The Hirer and/or the Authorised Driver(s) must not be an individual who is or has been a declared (or undeclared or discharged or undischarged) bankrupt and/or an individual who is being charged for bankruptcy. If the Hirer and/or the Authorised Driver(s) attempts to (i) register for a membership with Tribecar, (ii) tries to maintain a suspended/active membership with Tribecar, and/or (iii) continues to use the Services provided by Tribecar, he or she will be reported to relevant authorities for attempting or actively maintaining a contractual relationship without prior approval by the relevant authorities. Additionally, if an individual who has a membership with Tribecar is subsequently found to be a declared (or undeclared or discharged or undischarged) bankrupt, Tribecar shall be entitled to unilaterally, without notification, terminate the relationship and/or any agreement with the aforesaid Hirer, including the right to forfeit any amount due to the Hirer which is held by Tribecar. For avoidance of doubt, Tribecar does not permit or accept any Hirer that is or has been a declared/undeclared/discharged/undischarged bankrupt. Furthermore, if the Hirer/Authorised Driver/individual operates Tribecar's vehicles (the "Vehicles" and each, a "Vehicle") (with or without Tribecar's permission), he/she shall not be entitled to any insurance coverage whatsoever. The Hirer may add up to 2 additional named drivers ("Authorised Drivers") for his booking if he checks on "Additional Driver (s)" under the optional add-ons before completion of the booking and agrees to pay an additional surcharge as listed. The addition of such Authorised Drivers as a named driver of the Vehicle shall be subject to Tribecar’s sole and absolute discretion. use or permit the Vehicle to be used or operated in a manner contrary to the applicable laws in Singapore. for any illegal purposes whatsoever. Whilst a Vehicle is in the Hirer's possession, the Hirer acknowledges and agrees that he/she will be held fully responsible for any, but not limited to, vehicular accident, damages, lose, fire or theft caused to that Vehicle. The Hirer shall be responsible for the fuel, Electronic Road Pricing (ERP) and parking charges and Traffic fines arising from the use of the Vehicle provided by Tribecar during the Rental Period (defined in Clause 2(n)). The Hirer acknowledges and agrees that the Vehicles are strictly for use in SINGAPORE AND WEST MALAYSIA (i.e. Peninsular Malaysia). For the avoidance of doubt, reference to West Malaysia for the purposes of this Clause 2, shall refer to the following states in Malaysia [Kuala Lumpur, Johor Bahru, Malacca, Negeri Sembilan, Putrajaya, Selangor]. The Hirer acknowledges and agrees that any unauthorised use of the Vehicles in other countries and/or other authorised parts of Malaysia will result in the suspension of membership. The Hirer acknowledges and agrees that smoking in the Vehicles and/or bring pets onboard shall NOT be allowed in the Vehicles. The Hirer hereby acknowledges and agrees to bear all the costs and expenses that will be incurred for engaging professional services for the removal of any resultant stain in the Vehicle which is attributable to any of restricted acts of the Hirer as set out in this Clause 2(e). If the Hirer causes any inconvenience to other hirers and/or Tribecar, and/or damage to Tribecar's cars or other vehicles or properties, and/or fines/charges/penalties/fees which are attributable to the Hirer's action, the Hirer shall be liable and shall indemnify and/or reimburse Tribecar for any and all claims (including third party claims), actions, proceedings, demands, liabilities, losses, damages, costs (including legal costs on an indemnity basis) and expenses of whatever nature, arising directly out of or in connection the acts or omissions of the Hirer. Without the prior written consent of Tribecar, the Hirer shall not make or permit to be made any mechanical or other modifications, any alterations, additions, or repairs to the Vehicle, or fit any towing equipment or other accessories or non-standard tyres. In the event of any such modification, alteration, addition or repair (whether with or without the consent of Tribecar), any additional or modified part of the Vehicle shall be deemed to become part of the Vehicle and shall belong to Tribecar, without prejudice to any rights or remedies accruing to Tribecar under this Agreement. The Hirer shall return the Vehicle to Tribecar together with all tyres, tools, accessories and equipment, in as good order and condition (reasonable wear and tear excepted) as the state of the Vehicle was upon collection by the Hirer from Tribecar. The Hirer shall ensure that the Vehicle shall not at any time during the Rental Period be driven by any person other than by the Hirer or an Authorised Driver and shall procure that the Authorised Driver complies with the terms and conditions of this Agreement as if an original party hereto. The Hirer hereby acknowledges and agrees that it shall be solely responsible to Tribecar for any non-compliance by the Authorised Driver with the terms and conditions of this Agreement and that the Hirer shall indemnify Tribecar for any and all claims (including third party claims), actions, proceedings, demands, liabilities, losses, damages, costs (including legal costs on an indemnity basis) and expenses of whatever nature, arising directly out of or in connection the acts or omissions of the Authorised Driver. The Hirer shall bear all costs of repair and rectification for any damage to the Vehicle resulting from negligence or improper use of the Vehicle by the Hirer or Authorised Driver. In the event of any breach of this Agreement by the Hirer or Authorised Driver, the Hirer shall pay Tribecar on demand all losses and damages suffered by Tribecar (including all legal costs and expenses incurred for and on behalf of Tribecar for the enforcement of any provision in this Agreement, on a full indemnity basis) in connection with such breach, including any loss or damage arising from the loss of use or loss of or damage to the Vehicle for any reason whatsoever. The Hirer shall indemnify Tribecar in full against any and all claims, actions, proceedings, damages, losses, liabilities (including any loss of revenue, loss of profits or indirect damages), costs and expenses (including legal fees and expenses on a full indemnity basis) that may be brought against, suffered or incurred by Tribecar in connection with any use of the Vehicle, which are not otherwise covered by the insurance policy(ies) taken out by Tribecar. The Hirer is only authorised to use the Vehicle during the period of his/her (fully paid for) reservation (in accordance with Clause 3) ("Rental Period"). This use may be reasonably extended by a booking extension made via the Website. If the Hirer continues to use/operate the vehicle beyond the end of his/her reservation, he/she shall be charged late fees (in accordance with the Penalty Charges pursuant to Clause 11). However, should the use/operation of the vehicle extend beyond the end of the reservation by 2 hours or more, the use/operation of the vehicle by the Hirer shall no longer be authorised or permitted by Tribecar. In which case, insurance coverage and any potential insurance claims due to accidents during this unauthorised/unpermitted use will be denied. Furthermore, Tribecar may at its sole and absolute discretion report such unauthorised/unpermitted use/operation of the vehicle to the police as a theft of Tribecar's Vehicle. The Hirer use of the "End Trip" function shall mark the end of his/her reservation. The specific timing of the "End Trip" function may be set before or after the actual end of the Hirer's reservation. Once the "End Trip" function is used, the Hirer shall no longer be authorised/permitted to use/operate the Vehicle (unless separate permission if sought by the Hirer and given by Tribecar). The Vehicle and its equipment within or part of it (e.g. In-Car Camera, Tribecar Onboard Computer, USB Charger, etc) may be protected with anti-tampering device and systems (e.g. anti-tampering stickers). If damaged by the direct/indirect action of the Hirer, the Hirer may be liable for penalties, damages and fines as may be reasonably determined by Tribecar at its discretion. At the discretion of Tribecar, legal action may be sought against the Hirer in protecting the physical properties and intellectual properties of Tribecar. Furthermore, if the tampering leads to removal of critical information, e.g. removal of storage/memory for in-car memory, the Hirer's account will be suspended (possibly termination as well, as determined solely by Tribecar), all future booking removed without refund, and all insurance coverage (for past, present or future bookings) provided by Tribecar to the Hirer will be immediately revoked. (c) is properly parked and locked when not in use, and at the end of the Rental Period. The Hirer shall further be responsible for fuel, and all Electronic Road Pricing charges, parking charges, and toll fees arising from the use of the Vehicle and pay off all traffic summonses, including all notices and inquiries in connection therewith via the AXS after 5 working days from the relevant Rental by the Hirer. If any traffic summons, including all notices and inquiries are sent to Tribecar, Tribecar will charge an administrative charge of S$10.00 (exclude GST) deductible via the Hirer's e-wallet with Tribecar. For the purposes of this Agreement, "e-wallet" shall refer to the Hirer's digital wallet with Tribecar used for transactions made on the Website. The Hirer shall be required to comply with all the instructions provided by Tribecar (whether on an ad hoc basis or otherwise), including instructions provided by the employees or appointed personnel of Tribecar. Such instructions shall include without limitation to instructions from Tribecar to request that the Hirer ceases any actions that may endanger or damage the Vehicles or such other assets or property within the purview of Tribecar. In the event where the Hirer fails to comply with any instruction provided by Tribecar, Tribecar shall be entitled to fine the Hirer a minimum penalty of S$100 (excluding GST) for administration or such additional amount as Tribecar may reasonably stipulate depending on the quantum of the damages, costs and expenses incurred by Tribecar as a result of the Hirer’s non-compliance with Tribecar’s instructions. In the event of such non-compliance by the Hirer, Tribecar may also stipulate that the use of the Vehicle (including valid bookings) will be forfeited and withdrawn with no reimbursement to the Hirer. Any reservation of a Vehicle by the Hirer shall be made in advance of the Hirer's intended Rental Period ("Rental"). The Hirer shall only be entitled to reserve one (1) Vehicle within the same date and time period. The priority for the use of a Vehicle shall be on a first reserved, first served basis. The Hirer shall upon registration of an account with Tribecar pay to Tribecar the following amounts as security:-. for approved New Drivers, an additional deposit of S$100.00 applies. 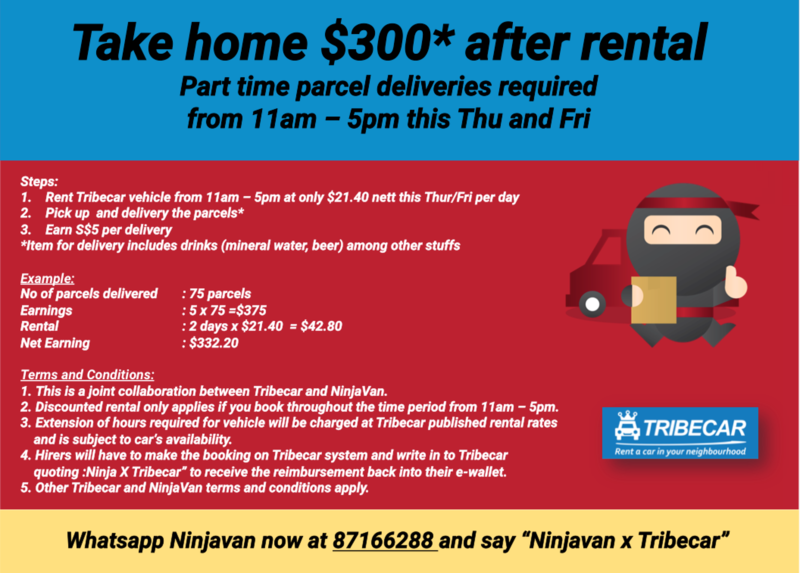 In relation to a New Driver who has previously paid the additional deposit of S$100.00 to Tribecar, in the event that such Hirer is no longer considered to be a New Driver (as determined by Tribecar) at the point of his/her termination of this Agreement and/or his/her account with Tribecar, Tribecar shall convert such additional deposit into credits amounting to S$100.00 in the Hirer’s e-wallet. In the event that the Hirer is still a New Driver at the point of his/her termination of this Agreement and/or his/her account with Tribecar, he/she shall receive a full refund of the additional deposit of S$100.00, in cash. Tribecar is a GST Registered company. All rentals and services shall be subject to GST of 7% payable during checkout which shall be borne by the Hirer. The relevant amount of credits in the Hirer's e-wallet will be deducted upon confirmation of booking. All reimbursements, refunds, compensations, adjustments by Tribecar to the Hirer shall be paid out only to the Hirer's e-wallet and not as cash or cash equivalent. Tribecar reserves the right to cancel all future bookings if the Hirer's e-wallet will run into negative balance as a result of such future bookings. In the event where there are no future bookings to offset the negative balance, membership will be suspended until such date where the Hirer has topped up his/her e-wallet such that his/her e-wallet no longer has a negative balance. The Hirer shall only be able to top-up the credits in his/her e-wallet by way of credit credit/debit card. Hirer will be required to pay a Payment Gateway Fee for all top-ups made to the e-wallet. The top-up amount will be as follows. Please seek the advice from Tribecar in relation to the applicable Payment Gateway Fees for top-ups above S$200. Without prejudice to Tribecar's other rights, Tribecar shall be entitled to forfeit and/or retain any part of the Hirer's Deposit in the event that the Hirer breaches, fails or neglects to pay any sums or charges due to or owing to Tribecar. For instance, late fees, damages caused, accident excess, dormancy fee, penalty fee, and etc. The Deposit will be fully refunded, interest-free only when the Hirer has cancelled his/her account with Tribecar and such Hirer has fully discharged his/her obligations stated in the Agreement. Such refund shall be made within a period of up to 45 working days upon the Hirer’s fulfilment of the aforesaid conditions precedent in this Clause 4(l). The Hirer acknowledges and agrees that Deposit may not be used to set off any part of any relevant rental fee due and owing from the Hirer to Tribecar. The Hirer's e-Wallet will be levied a dormancy fee after the account remains inactive for 6 months. For the avoidance of doubt, the first dormancy check will be carried out on February 2019. A Hirer (or the Hirer's e-Wallet) is considered inactive if he/she has not make a booking for the last six (6) consecutive calendar months. A dormancy fee of $5 will be levied on a monthly basis until the Hirer makes a booking. The dormancy fee of $5 will be deducted from the Hirer’s e-Wallet. To be able to make a booking, the Hirer shall ensure that his/her e-Wallet does not have a negative balance. After making a booking, the Hirer's account will be deemed to be active for another six (6) months. Upon the commencement of the Hirer’s Rental Period, the Hirer shall be provided a checklist setting out the condition of the Vehicle ("Vehicle Checklist"). Such Vehicle Checklist may be found in the glove compartment of a Vehicle or a digital version of such Vehicle Checklist may be provided to the Hirer. The Hirer shall inspect the exterior and interior of the Vehicle against the Vehicle Checklist for any dent, scratches during collection. The Hirer shall report to Tribecar any apparent defects found in relation to the Vehicle which is not listed under the original condition of the Vehicle as set out in the Vehicle Checklist, before leaving the designated parking lot which the Vehicle had been parked at the start of the Rental Period. If no report is made by the Hirer, the Hirer acknowledges and agrees that the prevailing condition of the Vehicle will be deemed to be aligned with previous condition as it was handed over. To make a report to Tribecar, the Hirer shall to take such photos of the Vehicle as is necessary to reflect any defects and/or discrepancies in the prevailing condition of the Vehicle vis-a-vis the original condition of the Vehicle and send such photos as evidence of such defects or discrepancies to [email protected] before leaving the designated parking lot which the Vehicle had been parked at the start of the Rental Period. The Hirer shall be required to check if fuel light of the Vehicle lights up UPON IGNITION of the Vehicle's engine and the Hirer shall report any issues with the starting of the Vehicle with photographic evidence of fuel light within 15 minutes upon collection of the Vehicle. IMPORTANT: All Tribecar Opel Mokka must be filled up to FULL TANK (Diesel Euro5) immediately prior to the conclusion of the Rental Period. Similarly, all Toyota Prius (Gen 4) must be filled up to FULL TANK (Petrol RON 95 or better) immediately prior to the conclusion of the Rental Period. If you return the car with less than Full Tank, you will be levied the relevant Fuel Top-up Charge per 1/8th of the tank or part thereof. The Hirer's Rental will start exactly at the start of the relevant Rental Period which the Hirer had booked and not based on the time which the Vehicle is unlocked by the Hirer. Any early collection of the Vehicle up to thirty (30) minutes prior to start time of the Hirer's Rental Period without any additional costs will be permitted, but will not be guaranteed and shall be subject to the availability of the relevant Vehicle, as shall be determined by Tribecar at its discretion. At start of the Rental Period or whilst the Hirer is in the midst of collecting the Vehicle, if the Hirer does not confirm that there is any damage to the Vehicle or issues with the Hirer's Rental via the Website (or via official support channels such as email), the Hirer acknowledges and agrees that Tribecar shall be entitled to presume that there is no damage to the Vehicle or issues with the Hirer's booking. This is particularly relevant to situations where the Hirer fails to complete the Start Trip process on the Website properly or otherwise. The Hirer’s Rental shall be considered to have been fulfilled/used in full upon the conclusion of the Hirer’s Rental Period. Therefore, even if the Hirer had not utilised the Vehicle during the relevant Rental Period, OR, if he/she had utilised the Vehicle for a fraction of the Rental Period, there shall be no refund or partial refund of the any portion of the fees paid by the Hirer for the relevant Rental. The Hirer shall be required to return the Vehicle in the same condition as it was provided to Hirer at the start of the Rental and the Hirer shall be responsible for any repair or refurbishment costs for any new defects found to be caused by Hirer. The aforementioned costs shall be added to the costs of the Hirer's Rental, subject to conditions. The Hirer shall be required to refuel the Vehicle using unleaded RON 95 / 98 or V Power. For Vehicles in the Standard or Premium categories, the Hirer is required to refuel such Vehicles using unleaded RON 95 and above (RON 98 or V Power). For Vehicles that uses Diesel, the Hirer shall be required to refuel such Vehicles using Diesel (Euro5 or better). In the event that the Hirer were to be found to have returned a Vehicle in a condition whereby the fuel light lights up upon the subsequent ignition of the Vehicle's engine, he/she hereby acknowledges that Tribecar shall be entitled to deduct S$50.00 from his/her e-wallet as penalty for his/her failure in refuelling the Vehicle. "Maximum Fuel Tank Capacity" shall refer to the maximum capacity of the relevant Vehicle’s fuel tank. "Prevailing Fuel Rate" shall refer to the prevailing per litre price of the petrol required for a certain Vehicle. The Hirer shall be required to end the Rental on or prior to the end of the Rental Period which was booked by the Hirer and the Hirer shall be required to return the Vehicle to its designated parking lot before the end of the Hirer's Rental Period. The Rental shall only be deemed to have ended: (i) at the end of the Hirer’s Rental Period, or (ii) after the Hirer has clicked on "End Trip" button on the Website, whichever is later. The Hirer hereby acknowledges and agrees that late return penalties will be imposed by Tribecar if the Hirer does not end his/her Rental successfully prior to the end of his/her Rental Period. Accordingly, the Hirer should allocate approximately 10 - 15 minutes in advance to return the Vehicle to its designated parking lot and end the Rental before the conclusion of the Rental Period that he/she had booked. For each fifteen (15) minutes block (or part thereof) which the Hirer has returned the Vehicle late, the Hirer acknowledges and agrees that he/she will incur a late return penalty of S$10.00 and the subsequent Hirer of the relevant Vehicle (if affected by the late return of the Vehicle) will be rewarded with S$5.00 of credit as compensation. Tribecar will not be responsible for loss of or damage to the Hirer's personal belongings and the contents therein (including any valuables, even if Tribecar has been advised on such contents) during the storage of such personal belongings in the Vehicle or while removing such personal belongings from the Vehicle and the Hirer hereby agrees to release Tribecar from any liability in respect thereof. The Hirer shall return the Vehicle to the Pick Up Location upon the termination of this Agreement (i.e. when the Hirer cancels his/her account with Tribecar). In the event where the Hirer fails to return the Vehicle to the Pick Up Location (i) when the Hirer cancels his/her account with Tribecar, or (ii) after a 2 hours period after the end of his/her Rental Period (for any reason whatsoever),Tribecar shall be entitled to repossess the Vehicle at the Hirer's expense at any time without giving him prior notice and the Hirer hereby irrevocably authorizes Tribecar or its representatives to enter into any premises where the Vehicle is kept to repossess the same without being liable to any action or proceeding at the suit of the Hirer or any person(s) claiming under or through him. The steps that Tribecar may take to repossess the Vehicle include, but are not limited to, entering the Vehicle with its spare key, towing the Vehicle, and/or relying on third party vehicle repossession services. The Hirer will remain liable for any damage to the Vehicle at the point of repossession. At the end of the booking or during the return of the car, if the Hirer does not confirm that there are damages on the car or issues with the Hirer's Rental booking via the Website (or via official support channels such as email), the Hirer hereby acknowledges and agrees that Tribecar shall be entitled to presume that the Hirer will be responsible to any damages found later on the car and that the Hirer will be responsible for issues with the Hirer's Rental booking. This is particularly relevant to situations where the Hirer fails to complete the End Trip process on the Website properly or otherwise. Should a Vehicle breakdown due to mechanical faults, Tribecar shall not be held responsible for any consequential and incidental loss, i.e. income, fuel etc. The Hirer acknowledges and agrees that in the event that a Vehicle has broken down, Tribecar will endeavour to provide a replacement vehicle to replace the Vehicle and if Tribecar is unable to procure a replacement vehicle, all subsequent confirmed bookings which are scheduled within the next 12 hours of the Vehicle breakdown may be cancelled, and the affected Hirers whose confirmed bookings have been cancelled shall receive a full refund of the rental fees in relation to such cancelled bookings. If the Vehicle that the Hirer rented is met with an accident, the Hirer shall be required to inform Tribecar immediately. The Hirer acknowledges and agrees that he/she shall not make any repairs or permit any repairs to be made to the Vehicle without Tribecar's approval. If the Hirer is found towing and/or repairing the rented Vehicle at any workshop unauthorized by Tribecar, Tribecar shall be entitled to impose such relevant penalty on the Hirer (in accordance with the Penalty Charges pursuant to Clause 11). The maintenance of the vehicle will be borne by Tribecar. Notwithstanding the above, the Hirer shall be required to take note of the Vehicle's engine temperature, The Hirer hereby acknowledges and agrees that the Hirer shall fully indemnify Tribecar and/or bear all the costs and expenses which will be incurred to repair of the Vehicle in the event of any overheating of the Vehicle's engine which is attributable to the Hirer's acts, omissions and/or negligence. If there are any issues with the Vehicle due to wear and tear and/or a Vehicle breakdown, the Hirer shall report such issues to Tribecar immediately and seek Tribecar's advice/permission before proceeding to fix such issues with the Vehicle. Tribecar shall provide 24-Hours breakdown and emergency service at no extra cost to the Hirer if the Vehicle suffers a breakdown or is involved in an accident. To utilise Tribecar's breakdown and emergency service, the Hirer will need to press the "Need Help" - Emergency Button on the Website during their Rental to call Tribecar's contact center. The Hirer acknowledges and agrees that the following scenarios would not constitute a breakdown of the Vehicle (i) where the Vehicle's keys are locked inside the Vehicle, (ii) where the steering wheel is locked, (iii) where a punctured tyres needs to be changed and (iv) where the stalling of the Vehicle is caused by empty fuel tank. The Hirer hereby acknowledges and agrees to pay Tribecar the relevant fees amounting to S$50.00 as and when the 24-hour breakdown and emergency service is found to have been deployed by the Hirer for the aforesaid scenarios which are not deemed to constitute a breakdown of the Vehicle. The Hirer must ensure that the Vehicle has reasonable amount of fuel, engine oil, auto-transmission oil, radiator water at all times. The Hirer acknowledges and agrees that his/her failure to perform such checks may result in damage to the Vehicle and Tribecar reserves its right to demand for compensation from the Hirer for any damage to the Vehicle which is attributable to the acts, omission and/or negligence of the Hirer. In the event that the Vehicle breaks down and is unable to move, hit on the 'Breakdown Button' on Hirer's account page and a tow service will be engaged. The Hirer acknowledges and agrees that he/she will be responsible for any damage, cost or expenses relating to the breakdown of a Vehicle which is due to the Hirer act, omission and/or negligence which results in the the wrong type of fuel being pumped into the Vehicle. The Hirer’s account may be temporarily suspended pending the investigation outcome of the breakdown or accident. For avoidance of doubt, the Hirer may not be provided access or means to make another booking for another Vehicle. * Not all vehicles are allowed for use outside of Singapore. These categories - Standard Sedan, Standard MPVs, Premium Sedan and Premium MPV - are only for use in Singapore, no insurance coverage will be provided for these cars if the cars are used outside of Singapore. The hirer will be liable for any all damages to the rental car and/or claims by third party. make a police report if any party suffers injury. CDW add-on will not be available for New Drivers and some vehicles. You will be given the option to purchase CDW if it is available for the Vehicle. PAI add-on is not available for New Drivers and certain Vehicles. You will be given the option to purchase PAI if it is available for the Vehicle. The Hirer must report any and all car accident (whether severe or minor), within 24 hours of its occurrence. In the event that the Hirer fails to report an accident within the stipulated timeframe, the relevant insurance company may repudiate the case and all claims will be reported directly against Hirer regardless of whether CDW is purchased. When an accident involving the Hirer occurs, regardless of own damage or 3rd party vehicle, the Hirer pre-authorizes Tribecar to deduct the insurance excess amount (if any) from their credit card/ debit card/ e-wallet / bank account regardless of the insurance outcome. Tribecar will refund (if any) the balance of insurance excess amount, less the cost of the accident, when the details of the accident are finalized. Insurance excess only covers the bodywork of the vehicle and Hirer will be liable for the loss of use subject to duration required for repair. Tribecar will not be responsible for any incidental costs, e.g. reimbursement of taxi fares etc, due to vehicle breakdown / accident. In order to enjoy the benefits provided by the Personal Accident Insurance (PAI), the hirer must have paid for this add-on during the creation of the Rental booking. The Hirer must provide a police report in addition to the usual GIA report for all accidents including personal injuries. The Hirer must inform and come down to Tribecar's appointed workshop for all insurance claims. The above PAI insurance plan covers both the Hirer and the Authorised Drivers up to 68 years old. Claims reimbursement will be made within 60 days from date of document submission and the Hirer hereby acknowledges and agrees that the payment of such claim reimbursement will be ultimately subject to the approval of the relevant insurance provider. A copy of inpatient discharge summary. Any other documents/receipts that may be requested by the Insurer from time to time. Tribecar will undertake such reasonable endeavours to process and submit the Hirer's PAI claim to the insurer but will NOT be held liable or responsible for any delays and claim rejection fully or partially by the Insurer and thereby reserve their rights to discontinue or terminate this Insurance scheme at any time without prior notice. Should the Vehicle rented by the Hirer be involved in any traffic offence during the period, the Hirer agrees to be liable for any issues with the vehicle that arise under the Hirer's care and agree to pay all fines and any amount government or semi-government authorities shall levy or impose. The Hirer shall ensure that he/she has a valid driving license during Rental Period and that he/shes complies with the Road Traffic Act. (Cap. 276). All rates are quoted in Singapore dollars and shall be subject to 7% GST (Goods and Services Tax) which shall be borne by the Hirer.. Rental is calculated on an hourly basis. The minimum Rental Period which a Hirer may book is one hour. Cost/fees/surcharges of the rental/booking shall follow the listed rates. However, bookings that spans peak festive period or high demand period may carry a surcharge or have a different rate. Furthermore, due to extensions/adjustments/cancellations/alterations, booking rates/charges may be calculated differently. As such, the system and Tribecar's determination of the cost of the rental/booking shall be final. In cases where there is electronic pricing errors, e.g. when rental/prices/surcharges deviates and is lower by more than 20% of usual rates/market rates, Tribecar shall have to right to cancel and refund bookings made under erroneous rates and refuse to honour the erroneous rates without any compensation. When the Hirer is liable to Tribecar for penalty charge(s), late fee(s), and/or any charges or fees owed to Tribecar, the Hirer hereby acknowledges and agrees that Tribecar shall be authorised to deduct such outstanding amounts due and owing to Tribecar from the Hirer's credit card/ debit card/ e-wallet/ bank account. All disputes with regards to invoicing, pricing, rental, booking, membership, fees, charges, penalties, contracts must be raised within 7 calendar days of issuance, delivery, communication by Tribecar (whichever is earlier). Otherwise, the dispute request will not be entertained or reviewed. For certain classes of car categories (e.g. Audi A3 in Premium Sedan), the Hirer will be requested to approve an authorisation hold of S$200.00 by Tribecar. This authorisation hold will reduce the Hirers credit card's credit limit but a charge will not be captured unless there is/are outstanding fee(s) due to Tribecar. It may be held for the length of the Hirer's Rental Period or for 7 days, whichever duration is longer. The Hirer may also be requested to re-do the authorisation if the authorisation has lapsed. This authorisation charge is tied to the Hirer's account and may be used to offset any charge(s) due to Tribecar for any booking/penalties/other charges. If the Hirer is unable to complete the authorisation hold, there will be no refund or partial refund for the booking. This is so even if the booking was utilized partially or not utilised at all. Cancellation charges will be borne by the Hirer if the Hirer cancels his Rental booking. The Hirer will be charged S$0.80 if Hirer cancels for more than 48 hours; Hirer will be charged 50% of the relevant fees for the Hirer's Rental if the Hirer cancels between 24 - 48 hours prior to the start of the Hirer's Rental Period. Separately, the Hirer will be charged 100% of the relevant fees for the Hirer's Rental if the Hirer cancels his Rental booking less than or equal to 24 hours prior to the start of the Hirer's Rental Period. Clarification - If the previous Hirer is late by more than 45 minutes, the current Hirer may cancel the booking and receive a full refund of his/her booking. For avoidance of doubt, the current Hirer will not be entitled to receive a share of the relevant late fees (i.e. to be charged on the previous Hirer) if he opts to cancel and refund his booking. The current Hirer will only be entitled to receive a share of the relevant late fees (i.e. to be charged on the previous Hirer) if the current Hirer proceeds with his booking. Hirer is responsible for ensuring their account with their private hirer service provider (e.g. Grab) is updated. In the event of any discrepancies between the Hirer's account with Tribecar and the Hirer’s account with their private hirer service provider, Tribecar will at its best effort to assist the Hirer, but Tribecar will not have any obligations to provide the Hirer any refunds. Tribecar will at its best effort basis put up an online announcement or email Hirers to inform on any changes to this Agreement and/or the terms and conditions for the use of the Website and Services. Tribecar will have the right to cancel any of the Hirer's booking/s for any of the following reasons: (i) for any dispute with Tribecar relating to any pricing discrepancy; (ii) the Hirer abusing the Tribecar Website and/or system; or (iii) the Hirer not complying with the terms and conditions stated by Tribecar in this Agreement. Tribecar shall reimburse the Hirer the full amount of the booking fees paid by the Hirer for the relevant Rental Period in respect of (1) a booking cancelled by Tribecar in accordance with this Clause 11(l), or (2) a booking amended by Tribecar in accordance with this Clause 11(l) which the Hirer subsequently cancels at any time prior to the Rental Period. For the avoidance of doubt, the reimbursement by the Tribecar under this Clause 11 (l)(ii) shall only be by way credits into his/her e-wallet, and no reimbursement shall be paid in cash to the Hirer. In light of Tribecar’s right to cancel or amend the Hirer’s bookings in accordance with this Clause 11(l), the Hirer hereby acknowledges and agrees that the onus shall be on the Hirer to check if there are any cancellation or amendments to the Hirer’s bookings within twenty-four (24) hours prior to the relevant Rental Period. In the event that the Hirer does not wish to proceed with a booking which has been amended by Tribecar in accordance with this Clause 11(l), such Hirer may cancel such amended booking at any time prior to the start of the relevant Rental Period and the Hirer will be entitled to a full reimbursement of the relevant booking fees to their e-wallet in accordance with Clause 11(l)(ii). If the Hirer does not cancel such amended booking before the start of the relevant Rental Period, the Hirer hereby acknowledges and agrees that he/she shall be deemed to have accepted the amendment of the relevant booking by Tribecar and the Hirer will not be entitled to any reimbursements for such booking amended by Tribecar. Tribecar reserves the right to terminate the Agreement if the Hirer breaches any provisions in this Agreement; or do or allow to be done any act or thing which in the opinion of Tribecar may jeopardize Tribecar's rights to the Vehicle and the safety of the Vehicle, Tribecar's property and staff, and the public. In view of public safety and the safety of Tribecar's Vehicle, property and staff, if the Hirer has 12 or more demerit points (under the DIPS program by the Traffic Police), or if the hirer has been blacklisted by other firms (affiliated or otherwise) for any reason whatsoever, Tribecar reserves the right to terminate the Agreement. For avoidance of doubt, if the e-Wallet is negative (i.e., the Hirer owes Tribecar payment), and if the money owed is the same or more than the security deposit paid by the Hirer, Tribecar may first deduct the amount owed by the Hirer from the security deposit and close the member's account and/or terminate this agreement without notice. Prior to the termination of this Agreement, the Hirer has to close his/her account by sending notice to Tribecar. The Hirer has to do so by filling up the termination form and mailing it over to Tribecar. All balances in the e-Wallet will not be returned and the Hirer are encouraged to exhaust them first prior to the account closure. If Tribecar exercises the right to terminate the Agreement, Tribecar will fully refund the Security Deposit and the balance of his e-Wallet (including any future booking that will be refunded as credit to the e-wallet first) to the hirer via a cheque or such other manner of payment which Tribecar may reasonably decide at its absolute discretion. This refund only occurs if there is no outstanding amount due to Tribecar and if Tribecar has no outstanding or ongoing unresolved issues with the Hirer. In exercising its right to terminate a Hirer's account, Tribecar may immediately suspend the account of the Hirer and suspend all future bookings made by the Hirer. Tribecar will also send the hirer an notification (via phone call/SMS/letter/email) of the suspension. If the Hirer did not make any bookings prior to his account termination, Hirer will be charged an administrative fee of S$5.00 (exlude GST) from Hirer's deposit. This booking engine may contain links to resources located on servers or websites operated by parties other than Tribecar. If the Hirer uses these links, he/she leaves this booking engine (i.e this Website). Such hyperlinks are provided for his/her reference and convenience only. The inclusion of hyperlinks on this booking engine to other websites or servers does not imply any endorsement of the material on such websites or servers (including but not limited to material relating to travel information or services) or any association with their operators. Tribecar does not control and is not responsible for such websites or the servers or the parties operating such websites or servers and accordingly Tribecar accepts no responsibility or liability for any material contained on those servers or websites, or the accuracy or legality of information contained on other websites or servers. Hirer is advised to use his/her own discretion when communicating and utilising services from these other websites or servers. If Hirer decides to access any of the third party websites linked to this booking engine (i.e. this Website), he/she is doing so entirely at his/her own risk. This Personal Data Protection Policy notice for personal data ("Notice") is issued to all our valued customers and guests (Collectively known as "Hirers") of Tribecar, pursuant to the statutory requirements of the Personal Data Protection Act 2012 ("PDPA"). Tribecar takes it responsibilities under Singapore's PDPA seriously. Tribecar also recognizes the importance of the personal data Hirers have entrusted to the Company and understands its responsibility to properly manage, protect and process your personal data of the Hirers. During your course of dealing with Tribecar, Tribecar may have, and / or will collect, use, disclose and process Hirers’ personal data for purposes, including, communicating; providing services, responding to your enquiries or complaints, provide you with information and/or updates on products, services and/or promotions offered by Tribecar and/or its associated and its subsidiary companies or any selected third parties and other purposes required to operate and maintain business as set out in Tribecar’s Personal Data Protection Policy (collectively referred to as "Purposes"). In order to conduct Tribecar’s business operations more smoothly, Tribecar may also be disclosing the personal data provided by Hirers to Tribecar’s third party service providers, agents and/or Tribecar’s affiliates and/or subsidiary companies or related corporations, and/or other third parties whether sited in Singapore or outside of Singapore, for one or more of the above-stated Purposes. Such third party service providers, agents and/or affiliates or related corporations and/or other third parties would be processing your personal data either on Tribecar’s behalf or otherwise, for one or more of the above-stated Purposes. It is necessary for Tribecar to collect and to retain your personal data. If Hirer do not provide Tribecar with your personal data, or do not consent with this Notice or our Personal Data Protection Policy, Tribecar will not be able to effectively provide products and/or services to Hirer, if at all. We are committed to ensuring that your personal data is stored securely. Tribecar have the right to request for access to, to request for a copy of and to request to update or correct Hirer personal data held by Tribecar. Hirer have the right at any time to request us to limit the processing and use of his/her personal data. (For example, requesting Tribecar and/or its subsidiary companies to stop sending Hirer any marketing and promotional materials or contacting Hirer for marketing purposes). Hirer’s written request should be email to: [email protected] and reply to sender to unsubscribe for future updates / promotions. By submitting your personal data to us, Hirer consent to Tribecar collecting, using, disclosing and processing your personal data in accordance with this Notice. Tribecar will also take it that all personal data provided by Hirer is accurate and complete, and that none of it is misleading or out of date. Hirer will promptly update us in the event of any change to his/her personal data. In some circumstances, Hirer may have provided personal data relating to other individuals (such as his/her spouse, family members or other third party including minors). The Hirer must represent and warrant that his/her is authorised to provide his/her personal data to Tribecar and Hirer have obtained the consent to the collection, use, disclosure and processing of their Personal Data in accordance with this Notice. Tribecar reserves the right to update and amend this Notice or Purposes from time to time. We will notify Hirer of any amendments to this Notice or its Purposes via announcements on Tribecar’s website or other appropriate means. If Tribecar amends this Personal Data Protection Notice or our Personal Data Protection Policy, the amendment will only apply to personal data collected after Tribecar has posted the revised Notice or Purposes. The Hirer accepts and agrees to be bounded by the conditions in this section before using the Vehicle for entry into Malaysia. Vehicle usage in Malaysia is only applicable in West Malaysia up to and/or no further than Kuala Lumpur, Malaysia. Hirer intending for entry into Malaysia has to indicate on checkbox for Malaysia usage prior to booking confirmation. If Hirer did not opt for Malaysia usage, vehicles are not allowed into Malaysia. Hirer will not be compensated for any partial use between Singapore and Malaysia during booking period. Only vehicles under the category Economy Sedan and Economy MPV are allowed for Malaysia Usage. Standard category cars are not applicable nor allowed entry into Malaysia. Hirer has to make a minimum booking of 6 hours to enter into Malaysia and agrees to pay an additional surcharge on top of hourly rental and compulsory Collision Damage Waiver (CDW) at an additional 6% of total cost. Extension will not be allowed for Malaysia use and late fee applies if the hirer returns the Vehicle beyond the booking time. The Hirer will be requested to approve an authorization hold of S$200.00 by Tribecar during the "Start Trip" process. The authorization hold will reduce the Hirers debit/credit card's credit card limit but a charge will not be captured unless there is/are outstanding fee(s) due to Tribecar. It may be held for the length of the Hirer's booking or for at least seven (7) days. If the Hirer is unable to complete the authorization hold, there will be no refund or partial refund for the booking. This is so even if the booking was utilized partially or not utilized at all. Any cancellation or amendment will be subject to existing cancellation and amendment policy. Hirer shall abide by all Singapore Immigration regulations and Malaysia government's regulations and be responsible for all Traffic Police and Court summons and fines. All unsettled traffic offenses or fines committed by hirer during the period will be charged to the hirer in full with additional administrative charges incurred. Hirer will be responsible for any incidental damages / cost incurred during booking in Malaysia, inclusive and not limited to outstanding traffic fines, breakdown, battery, tyres, towing fee, and any loss, damage, costs and expenses arising from the breakdown of the vehicle. In the event of accident, insurance excess for Malaysia use will be doubled own damage excess and third party excess (per accident basis, subject to 7% GST, see 8a). The compulsory CDW will reduce hirer damage own damage excess and third party excess (per accident basis, subject to 7% GST, see 8a). For insurance excess for New Drivers, see 8a. CDW and PAI is also not available for New Drivers. Hirer shall also obtain vehicle registration number, names and address of the parties involved. Hirer shall not abandon the Vehicle without any adequate provision for safeguarding in the event of an accident. Hirer is to make a police report and will be liable for any cost incurred if the Vehicle is loss or stolen. If the Hirer enters into Malaysia with a Vehicle without informing Tribecar, Tribecar shall be entitled to levy the Hirer a penalty fee of S$400 and/or immediately terminate such Hirer’s account and such Hirer’s security deposit of S$100 will not be refunded. Hirers who wish to re-apply for an account with Tribecar would need to have settled all outstanding fees / fines from prior membership period with Tribecar. The Hirer and the Authorised Rider(s) MUST have (i) a valid Class 2B/2A/2 License and (ii) at least 2 years of local riding experience, to be eligible for the rental and use of the relevant class of Motorcycles which such Rider is permitted to ride pursuant to the applicable license that he/she holds. For the avoidance of doubt, the Hirer acknowledges and agrees that he/she and the Authorised Rider(s) shall not make any bookings with Tribecar for any particular class of Motorcycle and/or ride any particular class of Motorcycle to which he/she does not have the applicable license to ride. Where applicable in this Agreement, for the purpose of this Clause 16, the terms "Driver", "Hirer" may be used interchangeably with the term "Rider". Similarly, "Driving", "Operating" may be used interchangeably with the term "Riding". Lastly, terms such as "Bike", "Scooter", "Vehicle" may be used interchangeably with the term "Motorcycle". In cases where the terms are unclear, Tribecar shall have sole discretion in the final determination on the usage of these terms. Motorcycle helmet (or safety headgear), gloves, or such other rider's safety apparel will not be provided with the booking. The Rider shall be required to bring along his/her own safety equipment. The Rider will not be able to start the Motorcycle once the trip is ended. For safety reasons, the Rider is advised not to use the End Trip function while on the move or when the Motorcycle is away from the designated parking. PAI (at extra cost) is mandatory for all Motorcycle bookings. The Rider is responsible for checking the conditions of the Chain and the Sprocket of the motorcycle (if applicable to the model) before riding the motorcycle. If the motorbike breakdown due to the chain comes loose or breaks during the rental, the Rider shall be responsible for the cost of tow and all repair costs (including Sprocket replacement if applicable). There shall be two trips for the tow, one from the breakdown point to the appointed workshop and another from the appointed workshop back to the designed parking location. All the motorcycles are equipped with an IU, as required by the government. This IU is constantly powered and drains the battery within the motorcycle. It is the responsibility of the Rider to run/ride the bike for at least 20 mins every 3 days to ensure the battery within the motorcycle does not drain completely which damages the motorcycle. The insurance policy for Motorcycles provides for commercial usage. The Rider may use the Motorcycles for deliveries and/or logistics services but NOT for the provision of passenger-carrying service. E.g., HonestBee / NinjaVan / Deliveroo / NTUC / RedMart / PizzaHut / McDonalds / Road Bull / Riverwood / GrabFood / Go-jek (Logistics/Services), etc but not Grab / Go-Gek (passenger carrying). The stated insurance excess only applies to authorised Riders whom are older than 23 years old and have at least 2 years of riding experience (based on passed date of the relevant riding class's Traffic Police riding test or the issuance of licence by Traffic Police for the relevant riding class, whichever is more recent). To the extent that is permitted by the law, for the purpose of accident/insurance claims, the Rider and his/her pillion shall be treated as one party (i.e. 1st party) as they are related parties. For avoidance of doubt, the pillion is not treated as a 3rd party in any accident/insurance claims. The Rider shall not take on passengers (pillion or otherwise) for reward or hire. The stated insurance excess excludes loss of use for downtime of the Motorcycle. The Services and all related components thereof provided by Tribecar are on "an is, as available basis". To the fullest extent permitted under applicable laws, Tribecar expressly disclaims all warranties, representation or endorsements whatsoever, whether express or implied (including, without limitation warranties of title or non-infringement, or the implied warranties of merchantability or fitness for a particular purpose), in relation to the Services, and any information or services related to the Services. Tribecar does not warrant that the use of the Website and/or the Services will be uninterrupted or error free. Amongst other things, the operation and availability of the systems used for accessing the Website and/or the Services, the computer networks and the Internet, can be unpredictable and may from time to time interfere with or prevent access to the Website and/or the Services. Tribecar shall not in any way be responsible for any such interference that prevents your access or use of the Website and/or the Services. Under no circumstances will Tribecar be liable for any loss or damage caused by your reliance on the information relating to and/or your use of our Website and Services. It is your responsibility to evaluate the accuracy, completeness or usefulness of any information, opinion, advice or other content available through the Website and our Services. During the Rental Period, the Hirer is deemed to have sole control and possession of the Vehicle or Motorcycle. Accordingly, subject to Clause 8, 9 and 16, the Hirer hereby acknowledges and agrees that the Hirer alone shall be liable during the Rental Period for all risks, claims, costs, damages, expenses and losses arising out of or in connection with their use of the Vehicle or Motorcycle, including, without limitation to, accidents, third party injuries, property damages, theft, vandalism, fines or traffic offences ("Accepted Risk"). If an Accepted Risk arises, subject to the other relevant provisions in this Agreement, the Hirer hereby acknowledges and agrees to take all action that may be required by him/her under the applicable law, including the filing of police reports and other relevant reports within the required time, and all other reasonable action to mitigate the losses relating to such Accepted Risk. If an Accepted Risk arises, the Hirer shall immediately notify Tribecar, and comply with Tribecar’s reasonable instructions and the other relevant provisions in this Agreement. a claim by any Authorised Driver(s) or third parties in relation to the Hirer’s and/or Authorised Driver’s use of the Vehicles or Motorcycle. Indemnity for breaches of this Agreement: The Hirer shall indemnify and hold the Tribecar and its officers, directors, employees and agents harmless from and against all reasonable costs, expenses or damages that Tribecar may suffer or incur, arising out of or in connection with the Hirer’s breach of this Agreement, including the costs of repair, repossession or recovery, except to the extent caused by Tribecar’s own default or negligence. To the fullest extent permitted under applicable laws, save in respect of death or personal injury caused by the negligence of Tribecar, Tribecar shall not be liable to the Hirer, the Authorised Driver(s) or any other person or entity for any direct, indirect, special, incidental, consequential or exemplary damages (including, but not limited to, damages for loss of profits, loss of data, loss of use or costs of obtaining substitute services) arising out of the use, inability to use (including without limitation due to any cancellations or amendments of bookings by Tribecar under Clause 11), unauthorised access to or use or misuse of the Services, whether based upon warranty, contract, tort (including negligence), or otherwise, even if Tribecar has been advised of the possibility of such damages or losses. To the fullest extent permitted under applicable laws, save in respect of death or personal injury caused by the negligence of Tribecar, the Hirer unconditionally releases and discharges Tribecar from all claims and liability, under contract, tort, negligence, equity, statute or otherwise, which the Hirer now have or may have in the future, arising out of or in connection with the Hirer’s and/or Authorised Drivers’ use of the Vehicles or Motorcycles ("Relevant Claim"). To the extent that the Hirer has a Relevant Claim against Tribecar, the Hirer unconditionally and forever waives such Relevant Claim, and the Hirer hereby undertakes not to take any action or proceeds in connection with such Relevant Claim. Notwithstanding the above, to the fullest extent permitted under the applicable laws, Tribecar’s aggregate liability for all claims arising from this Agreement (if any) to a relevant Hirer shall not exceed (i) the aggregate amount which the relevant Hirer had paid to Tribecar in relation to the use of the Services, Vehicles and/or Motorcycles, or (ii) S$100, whichever is lower. Each of the Tribecar Partners who is not a party to this Agreement shall be entitled to the benefit of Tribecar’s rights under the relevant terms of this Agreement, which shall include without limitation to the provisions relating to accident repair, insurance matters, refurbishment, cleaning, processing rentals and all car related matters. Such Tribecar Partners shall be entitled to enforce the aforesaid provisions as if they were a party to this Agreement. Save as otherwise expressly provided in this Agreement, no person who is not a party to this Agreement may enforce or is entitled to the benefit of any provision of this Agreement. The consent of the Tribecar Partners shall not be required for any amendment to, termination, or rescission of this Agreement.